I have a strange relationship with raw soups. When they are good, they are soooo good. And when they're bad, they are soooo bad. I'll never forget the raw cauliflower soup I made a couple of years ago. It was so horrible. I still have nightmares about that soup. It was also the soup that wouldn't die. It just so happened that the recipe made a huge quantity, so I was stuck with tons of this leftover vomit soup. I ended up freezing it in a large ziploc bag, and every now and again I would break off a hunk, defrost it, gag it down, and wish I had no tastebuds. (The question I ask myself now is: why? Why did I make myself keep eating this? I know you don't like to waste food, but you could have made an exception, just this once!!) Ahem. Anyway, this post is not about the cauliflower soup. It's about some raw soups that I love, like Gena's Raw Tortilla Soup. I love raw soup-and-salad combos in the summer months. It made for a wonderful dinner al fresco! I know, it doesn't look that attractive (at all), but it was mighty tasty, and easy to make, too. Just throw everything (red peppers, tomatoes, avocado, EVOO, seasonings) in the Vita-Mix and pulverize! However, there was a recent raw soup fail. I couldn't manage to take a decent picture of it, which should have been my first clue. I won't say where the recipe came from, but it was supposed to be a raw curry soup. It was somewhat better the next day (as many raw soups often are), but I wouldn't make it again. At least I didn't have to freeze any leftovers! Yeah, there really is no in between when it comes to raw soups. After having far too many really awful ones, I'm very reluctant to give them another shot. Gena's recipes, however, have a fighting chance! I make myself eat something that I absolutely hate in order to not waste food probably once a month. Why do we keep torturing ourselves? And same, about the raw soups. I love a delicious gazpacho, but once I made a raw smoky avocado soup and it was definitely one of those force it down moments. I'll have to give that tortilla soup recipe a try! I, too, have made a yucky raw smoky avocado soup - I wonder if it was the same recipe! I love the tortilla soup, but I also add a medium zucchini to the recipe to give the soup a little more body. I love to scoop up the soup with (non-raw) blue corn chips..yum yum yum! I'm scared of raw soups. My attempts at making them have typically resulted in an oddly frothy concoction that isn't really a soup so much as a smoothie... but I'm open to trying again! Indian, Mexican, Asian, and American! 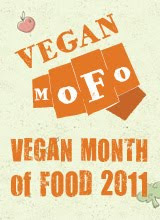 Love for Let Them Eat Vegan!